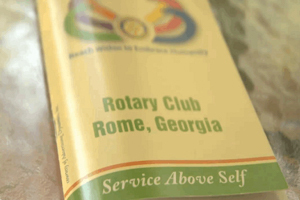 For a number of years, the Rotary Club of Rome Georgia has created a printed photo directory. It was the result of a lot of hours of work from a dedicated committee within the club and skilled typesetting/printing services of a local printing company. With 4" x 8" dimensions, it was convenient for club members to reference. However, it was a clerical challenge each year to communicate the new committee assignments and change of address information to the printer. It was also expensive to have typeset. We suggested they take an alternate approach using Microsoft Access. Our company created a Microsoft Access database and Word document template for creating this directory. It has reduced the overall time and printing costs by giving the committee members the means to create print-ready Adobe PDF content. We think it's a neat example of how the Microsoft Access and Word can generate attractive printed content. The development work was donated to the Rotary Club of Rome and we are making a free version of the database and Word template available for others interested in duplicating this directory for their clubs. Sample images from the database are provided below. A full sample directory in PDF format is available here. This same approach can be used for a variety of other printed products. The Microsoft Access reporting engine is very powerful. Many people are already comfortable with using this Office tool. We can help you add the extra details of alternate left and right page header/footers, smart page numbering, and similar Visual Basic for Applications goodies. Perhaps you want to create a PDF version of your product catalog? Or an internal staff photo directory? Give us a call and tell us how we can help. Note: All photos are courtesy of Wikimedia Commons. Fictitious name and address data courtesy of BrianDunning.com.